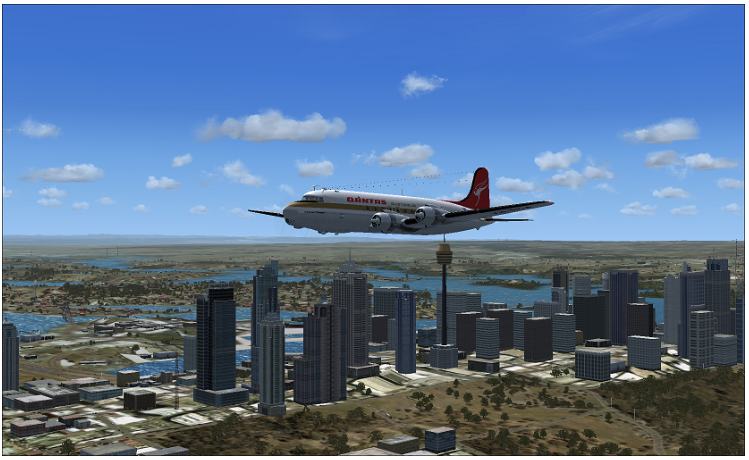 The Douglas DC-4 is a four-engined propeller-driven airliner developed by the Douglas Aircraft Company. It served during World War II, in the Berlin Airlift and into the 1960s in a military role. From 1945, many civil airlines operated it worldwide. 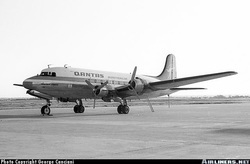 After the abortive DC-4E proved to be complicated to maintain and uneconomical to operate, Douglas responded to the Eastern and United requests for a smaller and simpler derivative. Before the definitive DC-4 could enter service the outbreak of World War II meant production was channeled to the United States Army Air Forces and the type was given the military designation C-54 Skymaster, with US Navy aircraft designated Douglas R5D. The first aircraft, a C-54, flew from Clover Field in Santa Monica, California on 14 February 1942. The DC-4's tricycle landing gear allowed its fuselage to be constant cross-section for most of its length, so it could be easily stretched into the later DC-6 and DC-7. A total of 1,163 C-54/R5Ds were built for the United States military services between 1942 and January 1946.The DC-4/C-54 proved a popular and reliable type, 1245 being built between May 1942 and August 1947, including 79 postwar DC-4s. Several remain in service as of 2011. An example is Buffalo Airways of Yellowknife, Northwest Territories. Douglas continued to develop the type during the war in preparation for a return to airline services when peace returned. However, the type's sales prospects withered when 500 wartime C-54s and R5Ds came onto the civil market, many of which were converted into civilian versions by Douglas. DC-4s were a favorite of charter airlines such as Great Lakes Airlines, North American Airlines, Universal Airlines and Transocean Airlines. In the 1950s Transocean Airlines (Oakland, California) was the largest civil operator of the C-54/DC-4. Douglas produced 79 new-build DC-4s between January 1946 and cessation of production on August 9, 1947. Pressurization was available as an option, but all civilian DC-4s (and C-54s) were built unpressurized. Purchasers of the new build aircraft included National Airlines, Northwest Airlines and Western Airlines in the USA and KLM Royal Dutch Air Lines, Scandinavian Airlines System, Sabena Belgian World Airlines, Avianca and South African Airways in overseas markets. Very few DC-4s remain in service today. The last three passenger DC-4s believed to be operating worldwide are all based in Johannesburg, South Africa. Two fly old South African Airways (SAA) colors. They are ZS-AUB "Outeniqua" and ZS-BMH "Lebombo" and are owned by the South African Airways Museum Society and operated by Skyclass Aviation, a company specializing in classic airliner charters to exotic destinations in Africa. The other Skymaster is ZS-AUA "Tafelberg" which is also operated by Skyclass Aviation but is leased from the Dutch Dakota Association. A 1944 built DC4 is currently being restored in NSW, Australia.